The Koh Chang 2007 Open will be held May 19 – 20 at Northern Lights. There will be a 501 Singles and Doubles competition with a maximum of 32/64 players. The Singles will be played on Saturday at 11 AM and the Doubles on Sunday at 11 AM. Taking a break from her practice routine for a few photos - the lovely Miss Wan the newest darts sensation in the Silver Dollar Bar. John Smith’s Dart League held their end of season party at D'Pelican Inn on May 1st. A great time was had by all. Special thanks to our sponsor John Smiths Beer and the staff and management of D'Pelician Inn for a great night. Above photos - the beautiful Miss Ann keeping league members happy with free mugs of John Smiths. Flaming Moe’s & The Moe Slyzak Experience won their respective divisions in Tuesday’s John Smith’s Dart League. 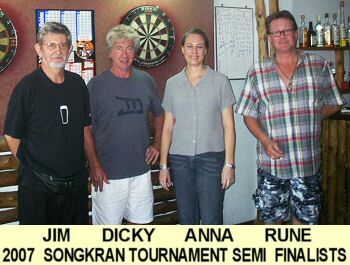 For a full report of the league results check out the Lower Sukhumvit Darts League website. A tentative captains meeting is set for 8 May to discuss the starting date for next season. All captains will be notified as soon as the date is set for sure. Paul Seigel (a.k.a. Dartoid) will be visiting Bangkok June 11 - 22. 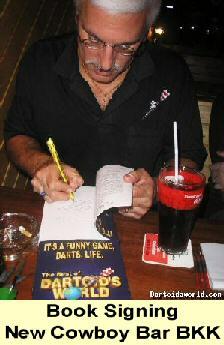 Undoubtedly the best read darts writer on-line for more than 15 years - and his book - "It's a Funny Game, Darts, Life". Paul is no stranger to Thailand with many articles from various parts of Thailand over the years. Paul is up for any and all darts challenges. With league play schedules taking up most of the week, Friday 15 June and Sunday 17 June are the best dates for a major darts event. Been contacting players from around the country to see which date would be best for the majority of players to attend. In addition to one major event, we'll set up as many others as possible depending on which venues are open for play - uncertain at this time with two new league seasons starting. 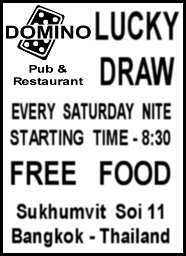 We invite all Thailand darts players to come out and meet Dartiod and give it your best shot in some competition. A set schedule will be in the June Newsletter. If you haven't already been to his website Dartoid's World check it out. The paragraph below from his site probably best describes Dartoid! Downunder Sports Bistro is a three floor operation with a bar on each floor. Two dart boards and a pool table are on the top floor. Along with three fully stocked bars their drink menu includes over thirty exciting cocktails. They have a full menu with Aussie favorites along with western and Thai dishes and open early with a full breakfast menu. Sports - fifteen flat screen television screens ( 8 satellite feeds) - in any one of the five sound zones that allow different sports to be played at full volume at the same time. A schedule of sports events is on their website. The Down Under Wabbalies darts team play in both the Monday and Tuesday dart leagues. All interested dart players are welcome to join the team for play on Mondays or Tuesdays or both. Been in contact with the Saigon International Darts League about setting up a challenge match. They have a keen interest in such an event and are willing to send 8 - 10 of their top Vietnamese and expat players here for competition. I have no doubt that we could field an equally qualified Thai and expat squad to meet the challenge. Finding a squad to fly to Saigon will be a bit more difficult. SEWA Darts Forum - We have a darts forum so why advertise another darts forum? Our form is primarily darts issues and announcements in Thailand. Posts from anyone around the world are certainly welcome but basically our forum is local news, Thai news. SEWA is the most popular darts forum on-line - news and posts from darts players around the world. Interesting, informative and seeing that some problems and challenges we face promoting darts are not unique to Thailand. Future challenge matches from Vietnam and possibly Korea are a proof positive result of posting on SEWA. I enjoy participating on this forum and talking about our darts scene here in Thailand. A few more opinions from Thailand would be nice company. 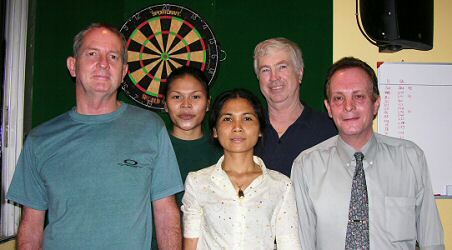 Darts Thailand - now in our fourth month and growing. A special thanks to those contributing information and photos. Osmo from Hua Hin. Magnus from Koh Chang and Bill from Phuket. Our Dart Bars list will be over 60 with some new additions added within the next few days. If you know of a dart bar anywhere in Thailand please email the information and it will be added to the Dart Bars Listing page.